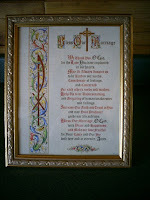 An elderly friend gave me this framed poem yesterday. I love it ! for each other's needs and wishes. guide our life and love. Posted by Lisa at 11:37 p.m.
Lisa, thank you so much for sharing this! I am sending my husband a love letter through the mail and had wanted to include something with it, this is just gorgeous and I know that he will love it! Thanks again! March 7, 2007 at 10:13 a.m.
How very nice!! That's definitely a keeper. I understand why you like it so. March 8, 2007 at 10:20 p.m.